Front “sidewalks” (almost as bad as hot water heaters) are one of the first things that visitors to your new home will notice. They are extensions of your house that welcome friends and strangers alike to your front door. Yet, as important as they are, many builders install sidewalks that are only 36 inches wide, which is simply too narrow to allow two adults to walk side-by-side, particularly if plants overhang the edges. According to guidelines published in Architectural Graphic Standards, the minimum recommended width for a two person walkway is 42 inches. As far as I am concerned, the minimum width for a two person walk should actually be 48 inches, with 60 inches being more preferable for an upscale custom home. I don’t know who determined that 3 feet was a good width for sidewalks or why it has become the industry “standard” for new construction, but no doubt cost was a major factor in the decision making process. Consider an “average” new home subdivision with 100 building lots. Let’s say that the “average” front walk will be about 40 feet long and 3 feet wide, or 120 square feet. Assuming a square foot cost of $3.00 to prepare and install a “standard” concrete walk, the sidewalk budget for each home would be about $360.00 or $36,000 for the entire project. Now, increase the width of each walkway to 48 inches and the costs for the entire project suddenly jump more than 33% to $48,000, which represents a substantial loss in company profits. However, if you look at the numbers as an individual homeowner, the costs appear to be more reasonable. While the price of a 4 foot wide concrete walk is still 33% more than the “standard” 3 foot sidewalk, the actual increase for one house (less builder mark-up) is only $120.00. 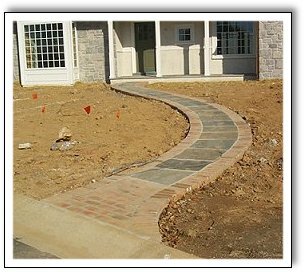 So, rather than force your guests to walk single file up to your front door or to ruin their hand made Italian leather shoes by walking in wet grass, you may want to consider making your front walk a little wider than the “standard” included in most new home contracts.